I chatted with the Asian owner of our corner store the other day, about what she thought of last week’s ABC story on slavery in Australia. It showed workers underpaid by $30,000 each while the company made $3 million, migrants who couldn’t speak English crammed into sublet flats, women subject to assault, and people operating machinery on an hour’s sleep. I asked her if she thought they would be ok with it? Perhaps because it’s money they wouldn’t normally be able to earn? Or, maybe because it’s what they’re used to back in their poverty-stricken country’s? Sounds ridiculous but you never know. Slavery makes up an alleged 20% of human trafficking victims. Estimates say over 21 million children and adults are slaves – close to the entire population of our country. Nearly 12 million of those are in Asia Pacific – think, Made in China. Here in God’s Country, we now know we are not immune. 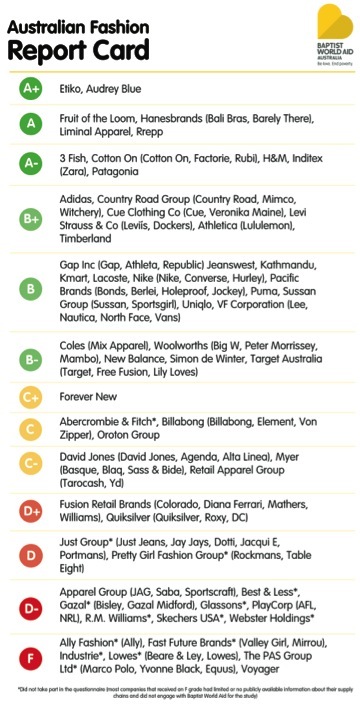 Later in the week, I came across this list, ranking fashion brands in terms of ethics – A+ are the dux of the class, then we carry right on down the drain. Big fail to two places I regularly shop at – Lowes for my kids school wear. And I’m sitting in a pair of Quiksilver jeans right now. Oh, R.M Williams, really? Salt-of-the-earth, great Aussie brand – my foot, you are. Writing about human trafficking is my mini mission to make a difference; however, my conscience has always whispered quietly in the background, asking me to do more. But, you know, life is chaotic with four small kids, some work and a book on the go. “I’ll do it later”. And then Kmart has four handballs for $4, some Converse replica’s for $10, and a Barbie caravan copy for $20. “How can it be made so cheaply?” I wonder, then promptly and conveniently forget about it as I look down and feel good in my new trendy shoes. (I’m hearing a collective “phew” from my friends that Kmart got a B here). Well, time’s up for me. “They’re still human beings” is my kick in the Quiksilver pants. Step number one is to be inspired by a project my son did on finding sustainable Christmas gifts. (He gave everyone soccer balls, which were sustainable because they would be played with forever and if they ever didn’t want it anymore they could recycle it back to him). I’m going to begin with Christmas gifts too. I will attempt to buy slave labour-free goods for all my family. This, in my mind’s eye, would lead me to local artisan’s, or small businesses. I like the thought of buying Australian, and you would hope it would be easy to track the source of raw materials and labour in this case. I also like the idea of sustainability, so might try and add this in too. I found this great website: http://www.behindthebarcode.org.au/ which looks at the treatment of the workers behind our fashion and electronics brands. This could be helpful. Although a very obviously first world problem, as they say, this still feels like a giant mission – how will I resist a 50% off mega Lego box until I know where it’s come from? Surely it cannot be that hard, thanks to the very helpful and kind heart of Google. Watch this space. My Christmas list starts now. I’ll let you know what I find. Are you coming along on Project Christmas Fair? If we could all live by your ideals Felic., the world would be a far better place. Fantastic, Alex – Thanks so much for letting me in on this – lots of great info on your page for how people go about asking the questions on fashion industry ethics – and awesome designs too!! Good luck and you definitely belong on the Project Christmas Fair list. I’m in too – already have a pattern for your crocheted scarf Christmas pressie! Etsy is an awesome place to buy quirky, home made, locally sourced, gifts. I’m a firm believer in changing the small things, making a difference in your small sphere of influence. If all of us did that, what a wonderful world we could live in!